The Armed Forces Vocational Aptitude Battery (ASVAB) is a test all enlisted candidates must take with the recruiter during the enlistment process. It is typically taken in the office on the computer in a shortened format. Then you will take the full ASVAB again at Military Entrance Processing Station (MEPS) on the day you swear into the Delayed Entry Program (DEP). The test is actually multiple subtests and graded with an overall percentile score – not percentage score. In other words, you are ranked accordingly with other recruits and by a percentage that you got correct. A 65% does not mean you got 65% right. You scored better than 65% of those taking the same test. The categories of the Armed Forces Vocational Aptitude Battery are the following: General Science (GS); Arithmetic Reasoning (AR); Word Knowledge (WK); Paragraph Comprehension (PC); Auto and Shop Information (AS); Mathematics Knowledge (MK); Mechanical Comprehension (MC); Electronics Information (EI); and Sum of Word Knowledge and Paragraph Comprehension (VE). The “ASVAB Score” is actually the “AFQT Score” of the ASVAB test. This is a combination of four sub-tests that the recruiters will review to see if you can even enlist into the military. It is little to do with what job in the military you qualify for. The AFQT score is not a pass / fail grade – it is basically a minimum standard for recruit entry into the military. Just because you meet the minimum standard does not mean you are granted entry into the military. There are other tests, standards, and qualifications a recruit must meet like medical clearance, criminal history, academic history, and personnel limits. The recruiters have a limit that they can allow in as well as a quota they strive to meet. There are only so many open slots for new recruits in any given time period. For instance, if you are an Air Force recruit and you have the AFQT score of 40. (Minimum Score allowed of 36). Had you scored a 35 or less the recruiter cannot accept you. A 40 means you meet the ASVAB standard, but if the Air Force has several other candidates well above the 70+ range (which they typically do) you are likely not competitive enough to get into the Air Force at this time. A recruit should study for the ASVAB as want to score as high as you can, because recruiters are going to take the best first and then work their way down until all positions are filled. The AFQT is also in effect, a “composite score” itself being derived from four of the subtest areas. But it is the same for all branches. The other Composites are unique to each branch and the jobs related to them. 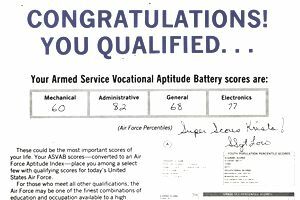 To qualify for specific Air Force jobs, applicants must achieve a specific score in the applicable Air Force Aptitude Qualification Area. The areas are G-General, A-Administrative, M-Mechanical, and E-Electrical. (*GAME). General (G): Determined from Arithmetic Reasoning (AR) and Verbal Expression (VE). of the ASVAB. Administrative (A): This score is computed from the Numerical Operations, Coding Speed, Verbal Expression (VE) = Word Knowledge (WK) and Paragraph Comprehension (PC) portions of the ASVAB (see note below). Mechanical (M): Determined from General Science (GS), Mechanical Comprehension (MC), and Auto/Shop (AS) sub-tests of the ASVAB. Electrical (E): Determined from General Science (GS), Arithmetic Reasoning (AR), Mathematics Knowledge (MK), and Electronics Information (EI) sub-tests of the ASVAB. See the Air Force Enlisted Job Description & Qualifications pages to see what composite scores are required for each Air Force enlisted AFSC (job). Note: the Numerical Operations and Coding Speed sub-tests were eliminated from the ASVAB in 2002 and 2003. To compensate for these missing values, and to keep the Administrative Composite equal to those who took the ASVAB prior to the change, the Air Force loads a "dummy score" in place of the NO and CS sub-test scores for those who take the ASVAB after the change. The "dummy scores" used as replacement values are the average scores received on these two sub-tests from Air Force applicants for the 12-month period prior to the change.